The history of Ambra Castle, also known as the Castell de Pego, has been radically revised in recent years as the result of archaeological studies. 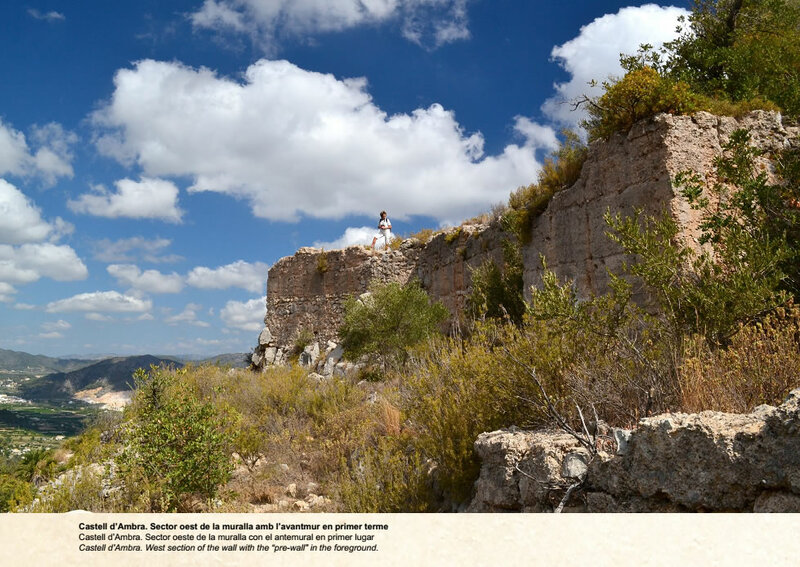 Previously, during the 1980's it was considered to be a 12th or early 13th century Almohad castle/albacar, then possibly a mid-12th century Almoravid construction. 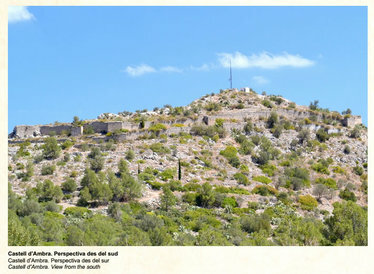 But excavations carried out between 1992 to 1997 have revealed that this fortification started to be built almost 100 years later, at the height of the Christian re-conquest. Islamic coins minted in Murcia between 1228-1238 were discovered in the deepest (earliest) excavation levels, showing that the castle must have been founded during or after this period. Other finds were shards of every day Islamic pottery, of the type made in Denia, but there were no complete pots, glazed luxury items nor any agricultural implements. At upper levels they found pottery from the early Christian era, of a type manufactured in Valencia and other Islamic coins dating from 1262-1266. The structure of the castle provides more clues as to its uses. 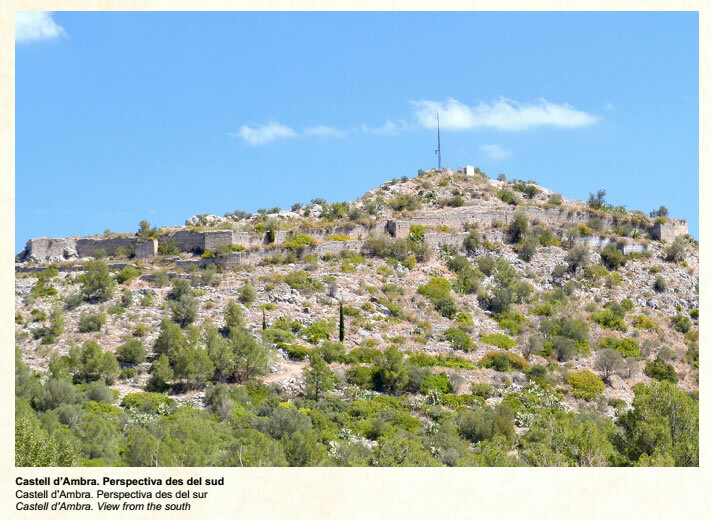 It is located on a steep hill overlooking the Pego valley and is inaccessible from the northeast because of vertical cliffs. Therefore it needs only to be fortified on the southern side. Unusually, there is a "pre-wall" or barricade outside the main castle wall (A). 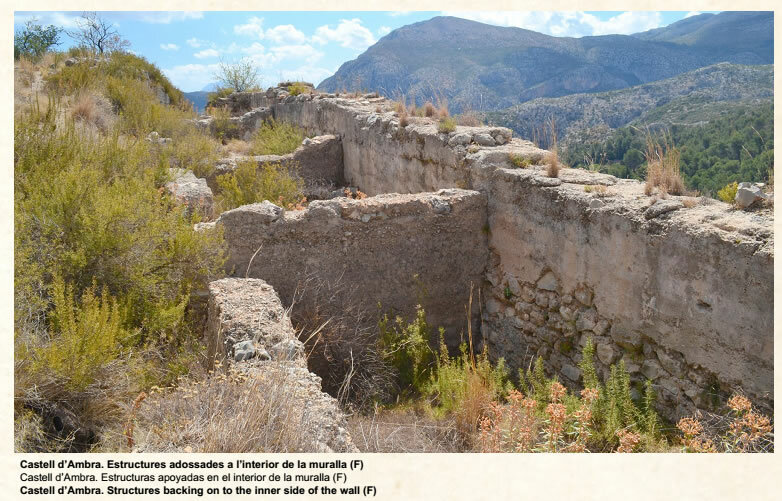 This type of structure has not been found in Alicante fortifications built before this time. The pre-wall obliges people entering the castle to come through an entrance protected by a turret, they then have to pass along a vulnerable path which runs between the two walls before arriving at the main entrance near the eastern end. This consists of another dog-leg entrance with three successive gates (C and E). The outer wall is made of tapia on stone masonry with sections with a "zipper" (in /out) layout running parallel to the main fortification. The main enclosure follows the contours of the land and is protected by a wall with small towers jutting out at intervals. This is made of tapia panels on stone masonry and one can see loopholes (slits for shooting through) and "lanceras" - holes for poking spears through, in some sections. Inside the fortified area there are simple dwellings. These have only one or two living rooms and it is not possible to determine what the rooms were used for, although some of them have a circular hearth dug in the ground. 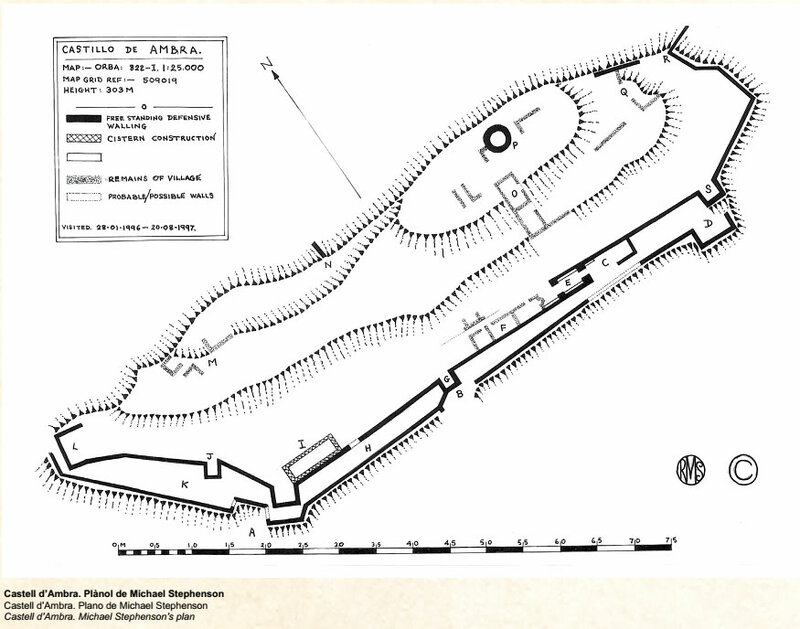 There is also a group of rooms backing onto the wall just west of the entrance one of which could be an ermita (chapel) (F), and another room has a bread oven, three metres in diameter, which would have been big enough to supply everyone in the compound. Further away, there is a rectangular water cistern also abutting the wall (I). Coins dating from the end of the 13th century have also been found. ﻿﻿﻿﻿The whole area looks like a complex of collective rooms for community use. The simplicity and scarcity of the Islamic pottery is in sharp contrast to the elaborate fortifications, implying that it was used periodically as a refuge by people with limited resources, such as the country-folk who lived in the twenty farmsteads nearby. It is not known whether the castle was built by the country-folk on their own, or with the help of regional Muslim authorities. 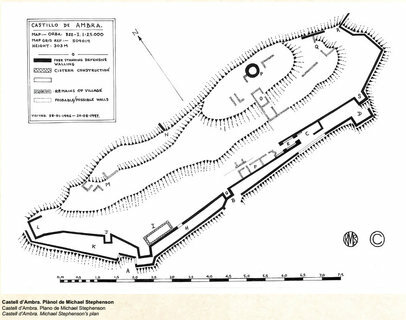 The archaeological record shows that Ambra castle was occupied for very short period between 1230/1240 and 1280/1290. The Christians took control in 1245 soon after the fall of Denia, but the enclave returned to Muslim hands two years later until 1258 when a small Christian garrison was stationed there. It was again in Muslim hands in the 1270's, but the castle lost its importance after the end of the 1276-1277 Muslim rebellion. 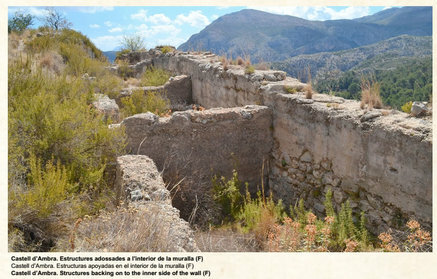 In 1279, King Pere (the Great), son of Jaume I, gave the instruction to construct a new town in the Valley of Pego and in 1280 the majority of the Muslim population was expelled. Consequently the castle was abandoned and dismantled.